Tucked away between the Indian state of Sikkim on the east and the high mountains of the Makalu Barun range in the west, the Kanchenjunga area shares its northern boundary with that of Tibet. Hinduism and Buddhism, tropical and alpine, all meet and merge giving rise to a rich biodiversity and a variety of cultures of numerous ethnic groups and communities. This is an ancient land that cradles an ancient cultural heritage. Remoteness has in many ways disadvantaged the people though. Taplejung, now the district headquarters, has only in 2000 been connected by road to the rest of the world. Traditionally, this was the point of exchange in trading routes between India and Tibet. 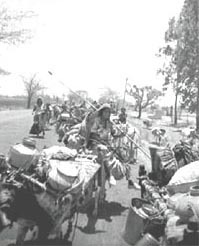 Today, the modern world has arrived via buses and trucks bringing an influx of foreign goods and people into this remote area. The pressure on this stunningly beautiful and varied land that is the Kanchenjunga Conservation Area is increasing today as soil degradation causes food production to fall and trekking tourism leads to deforestation and garbage pollution. Since 1990, foreign tourists have been allowed into the region. Currently, compared to the more popular trekking route of the Annapoorna Conservation Area Project (acap ) in central Nepal (see box: All that glitters gold ), which receives over 50,000 tourists per season, the Kanchenjunga area recieves less than 1,000 foreign trekkers a year. Obviously all these changes are bringing in new demands and throwing up a host of development challenges. Recognising the need to address these challenges and to conserve the biological and cultural wealth of the region and drawing inspiration from the success of acap the Kanchenjunga Conservation Area Project ( kcap ) was concieved. Since 1997, kcap is being jointly implemented by the World Wide Fund for Nature ( wwf ) Nepal, in collaboration with the Department of National Parks and Wildlife Conservation ( dnpwc ) of His Majesty's Government ( hmg ) of Nepal. Like India, Nepal too has followed a western model of protected area mangement, designating affected areas as national parks with strict enforcement by law. There are 16 protected areas covering 15.7 per cent of the land. Encroachment by local people has elicited stern action while no compensation was paid when wildlife damaged crops and killed cattle. While the most popular areas in Nepal are the lowland Terai and the middle hills. The fragile ecosystems of higher elevation are not immune to intensive exploitation. The Kanchenjunga area is no exception, and almost all members of local communities rely extensively on surrounding forest and pastureland. Says Chandra Prasad Gurung the country representative of wwf Nepal programme, who was also instrumental in the creation of the participatory Annapoorna model in the 1980s, "For any conservation strategy to succeed the livelihood strategies must be incorporated into the management plan. acap addresses the problem of maintaining a crucial link between economic development and environmental conservation. Long term maintenance of biodiversity cannot be achieved without improving the economic conditions of the indigenous people. This approach calls for giving people responsibility in conserving biodiversity while empowering them to utilise the resources in a sustainable manner." kcap seeks to further explore and develop this participatory model of conservation. Thus in 1998 a field station with a staff of 14 members was set up in the sherpa village of Lelep. With the repressive and iron-fisted management style of National Parks creating an atmosphere of fear and mistrust amongst Nepalis , the kcap team had a tough time initially. Facing the suspicion and hostility were Langkpa Sherpa and Lata Paudel the two young enthusiastic women community mobilisers from Lelep and Sunil Bhandari the administration officer. Convincing people about the role and meaning of the project proved to be more difficult than they imagined. "We had a tough time when we began. People were openly hostile as they were convinced that the area was going to be made into a National Park. People were scared that their access to forests would be stopped" says Langkpa. If the local communities were openly hostile then jealous local government officials and other development agencies were not exactly helpful either. "At meetings with district level officials we had to face sarcastic comments like "You people don't need any help from us, you have your project money..." recounts Langkpa. Adds Sunil "Before we came in there were atleast 60 other ngo s working in this district. A hotbed of politics. Initially they were suspicious of wwf as a new entrant and reacted cautiously, either guarding their turfs or sought personal benefit". People of this impoverished land have traditionally been supporters of Left parties. The heat of local politics that often takes a violent turn forced kcap to withdraw for a while. Local district officials complain that they have not been informed about the plans. A meeting with Vijayraj Thebe the President of the district development committee reveals a lack of understanding of the projects objectives and a conflicting official approach to development plans for the region. "I have not been adequately informed about kcap activities" says he, while going on to add grandly "I think the area of the project should be increased. What we need is to build a large modern airport to increase capacity. That will help the economy of the region to grow". Rangers and field programme officers are appointed by hmg . Having worked in other National Parks they bring with them their feudal attitudes. With a wry smile Sunil says "I must say they have certainly changed after being posted here." Working with communities has been a novel experience for them. "They admit defeat when dealing with ticklish, complex social problems of communities" chuckles Sunil. Even appearances are important and had to be changed. Bedbahadur Kharka, a ranger, confesses "I have begun wearing a printed shirt and not my green battle fatigues, something that people associate with National Park staff and the army." Agrees Bhim Bahadur Limbu the Village Development chairman of Tapethok a village within the conservation area. "Bringing the army here is a bad idea. Of course you always have thieves amongst us but to stop them only locals can do anything, right?". Along with locals the wwf organised a clean up drive at the Kanchenjunga base camp. Eight rubbish pits were made to dispose off nearly 3,000 kilogrammes of garbage accumulated over 10 years. What could be burnt was incinerated on the spot, the rest of the non-biodegradable stuff was brought down. Sagarmatha (Everest) is the highest rubbish pit in the world. I hope Kanchenjunga doesn't become the third highest" comments Jenny Gurung a field officer with kcap . The success of a participatory people based approach to any conservation management plan depends on the role of communities. The staff at kcap have their task cut out. Remote and isolated, this is a land where poverty and ecological and cultural decay, have taken their toll on people. Given a choice most would want to migrate. Many already have. To encourage people an award was even constituted for the best conservation efforts by an individual. Numerous self help initiatives have been introduced by the project staff. Creating mothers groups, income generating activities, micro-credit schemes, reconstructing monasterys, building trails and improving bridges have been some such efforts. These efforts besides garnering support were also targetted to get people to understand that unlike National Parks this is a participatory project with a balancing of conservation and development priorities. Yet, the kcap region faces a host of challenges. Largescale poverty, subsistence farming, large but ecologically fragile areas, lack of alternative sources of energy, overgrazing, high population growth, have complicated environmental issues. A slash-and-burn farming method with a diminishing rate of return has destroyed seed banks of high altitude forests. As it is these forests are difficult to regenerate. Villages at colder and higher elevations consume remarkable amounts of fuelwood. In Walangchung Gola roughly 40 kilogrammes of wood is consumed per day per household. Increased cardamom farming in this area, a recent phenomenon, has resulted in increased use of firewood used to dry the pods. Being avid trappers and hunters, hunting of wildlife by locals and outsiders goes on, though kcap staff believe that incidents of poaching have reduced because of their presence. Kanchenjunga is at a crossroads today. Explains Chandra Prasad Gurung, of wwf Nepal, in the context of the acap experience "Politicians in Nepal need more conservation education otherwise short-term development gains might jeopardise long-term conservation issues. On the other hand ngo s alone cannot run a system. Their role is to strengthen the government. In kcap the chief warden is appointed by His Majesty's Government ( hmg ). He is the boss and he is in charge. The dwnpc is in the driving seat, we are only playing a supporting role. This is a crucial experiment wherein for the first time hmg is implementing a protected area management strategy without using the military. It is a very challenging task. I am very excited about this and quite optimistic." The unfolding kcap experiment will be a test case in protected area management between the state, civil society and local communities. In its success will lie lessons for all concerned with the question of ecological security of the subcontinent. The biggest hurdle in providing the much-needed drought relief is corruption in the government machinery. Rajasthan has spent almost Rs 6,500 crore on drought relief works like employment generation, fodder distribution and drinking water facilities in the past 45 years. Another Rs 628 crore has been spent in the last 27 years to stop the spread of the Thar desert. But there is no impact. Three of the districts in the Thar, Jodhpur, Churu and Barmer, have had drought in 31 of the past 38 years. The state government admitted that there were huge leakages in its drought relief works last year, and officials say at least 30-40 per cent of the money never reached the people. In the case of the districts in the Nasik division of Maharashtra, the public distribution system ( pds ) has collapsed. Recent raids on some pds shops revealed that the foodgrain meant for drought-hit tribal people was being diverted to black market. It might have caused the food scarcity in a drought year, which claimed the lives of 8,000 children. "Today Rs 60 out of Rs 100 in wage schemes is reserved for wages, but in reality only Rs 10-15 actually goes to the poor worker, the rest is illegal income for bureaucracy, contractors and politicians," notes the approach paper of the Planning Commission for the Tenth Five Year Plan. Whatever actually reaches the people in the name of drought relief is not spent wisely, and doesn't go a long way in drought-proofing. "Drought is not like most other disasters: it can be seen coming, slowly, from a long way off," wrote Lloyd Timberlake in Africa in Crisis , a book on drought in Africa. India has seen it come for almost 5,000 years. How can such a frequent phenomena become a disaster in Rajasthan, where drought extended to 16 of the last 20 years? Drought becomes an annual disaster when effort is not made to drought-proof -- provide long-term relief against drought. This can be done by regenerating the natural asset base in villages, in other words, good management of land, water and forest so that there is a buffer for times when rains are below normal. But when drought occurs in the absence of drought-proofing, the only thing to do is to make sure that it doesn't become a famine. In times of famine, food for work programmes are used to provide employment, so that the people have money to buy food, water and fodder. Over the years, the Indian government has devised numerous schemes built on this concept. India has more than a dozen programmes with a budget outlay of more than Rs 11,000 crore per year to fight drought and reduce rural poverty. The magnitude of the current drought indicates that these programmes have gone haywire somewhere. "The government emphasis is on developing infrastructure like roads and buildings. It didn't focus on the real assets of communities," says Koda Ramakrishna Reddy, expert on minor irrigation projects at the Krishna Deva Raya University, Ananthapur, commenting on drought relief work in Andhra Pradesh. 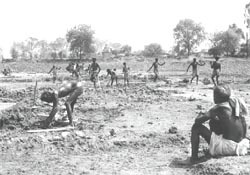 The first drought management programme in India, the Rural Works Programme, was started in the 1950s (see box: Programmed for drought ). Its focus was employment generation. It was rechristened as the Drought Prone Area Programme ( dpap ) in 1974, with the focus shifting to using employment generation for creation of assets. A recent audit report by the Comptroller and Auditor General of India shows dpap has consumed Rs 2,195 crore since 1974 (see table: Money down the drain ). Yet drought-prone area has increased from 55.3 million hectares (mha) in 1974 to 74.6 mha in 1995. Since 1995, 5. 9 mha has got added to it. This is besides the 2.6 mha which is under the Desert Development Programme ( ddp ), which started as a programme to revive the ecology in hot and cold deserts. According to estimates of the Planning Commission, up to the end of the Eight Five Year Plan, about 16.5 mha rainfed/ degraded land was treated. However, the net sown area has remained stagnant at about 142 mha. It is estimated that this might be due to an equal area getting degraded every year. The high-level Hanumantha Rao Committee was set up in 1994-95 to review dpap and ddp . The committee observed that these two programmes had failed grossly, and recommended their implementation on watershed basis with people's participation to make the programme sustainable.dpap created physical structures that are either useless in drought-proofing to begin with or become useless without the social institutions to take care of them. Thus once the programme is withdrawn, it is back to square one. The second most important hurdle is that the programme works on a target basis. So, if 500 hectares has to be treated in five years, it would mean four years of activities and one year of gradual withdrawal. By the time the government withdraws, the structures are ready, but the village community is not organised enough to maintain it. A major survey of 70 villages in Maharashtra and Andhra Pradesh by the Indian Council of Agricultural Research ( icar ) in 1998 found that increase in agricultural production due to watershed development activities lasted no more than two years. It brought into focus the post-project bankruptcy in institutions at the village level. "Strict orientation to achieve physical targets leaves field staff little time to promote social organisation," says the icar report. To make village institutions mature enough to take up watershed development more intensely, a watershed development fund was created in 2000 and the National Bank for Agricultural and Rural Development has been entrusted to take up 100 districts in three years. One-third of the money would be spent in empowering watershed committees. According to a undp report on environment regeneration and poverty alleviation, it takes 10-15 years for a village to regenerate its ecology and create prosperity. Villages such as Ralegan-Siddhi in Maharashtra and Raj-Samadhiyala in Gujarat have put in more than 15 years of efforts to insulate themselves from drought. Fund crunch and institutional vacuum at the village level can threaten major watershed programmes, like that of the Madhya Pradesh government, perhaps the world's largest watershed development mission. The highly participatory programme's success has been measured by the regeneration of one of its most backward and drought-prone districts: Jhabua. Without a realistic time frame to put the ecology on a sustainable path and in the absence of empowered village institutions, Jhabua might see a reversal of fortune. The first phase of the programme is over and 69 watersheds have been handed over to the community. But an evaluation by the Dahod-based N M Sadguru Foundation shows that due to absence of mature institutional backing, the impact of the programme might disappear in the long run. On the funding pattern, the evaluation report says that in all the sample watersheds, money was not available to take up all the activities drawn up in the project report. In October 1999, the first phase of funding under dpap stopped and by this time most of the watersheds in the districts had hardly completed 40 per cent of activities as mentioned in the guidelines. To meet their targets, the district authorities took up the development of 113 watersheds with the money sanctioned for 54. "With the restraint in flow of money, the interaction between the villagers and the government collapsed," says Jam Singh, a former member of the watershed committee of Kakradara village, one of the most successful watershed villages in the district. Out of its 650 residents, 400 have migrated for the second consecutive year. Badli Bai, who was heading the once thriving women's thrift group in the village, says, "The awareness created in the last four years can't die. But, what we need now is a few more years of help to make our village self-dependent." One programme that can address this concern is the Jawahar Rozgar Yojna ( jry ), which for the first time gives the relief funds in the hands of the village councils. jry was launched on April 1, 1989, by merging two other employment generation programmes. It was for the first time that local government institutions ( panchayat s at the village, block and district level) were given the charge of implementing employment generation programmes and also to maintain the assets created. While 70 per cent of the project fund was given directly to the village councils, the remaining was allocated to the block- and district-level panchayat s.
Financial bungling at the district level by government officials and, in some cases, by panchayat members, however, have made the project a huge failure. According to an evaluation by the Union ministry of rural development between June 1993 and May 1994, jry generated an average of 11 days of employment per person per year. According to an assessment by the Planning Commission, the programme did start a process of community involvement and management in structures created by the programme and evoked a response from elected representatives. "It was an experiment to gauge the response of the village-level leaders. And it was encouraging," says NCSaxena, secretary, Planning Commission. But, the way the programme is designed has left enough scope for the district bureaucracy to manipulate it. A panchayat has to get projects technically certified before implemention begins, and then again after implementation. This only led to delays and harassment of local leaders. "Unless technical officials are also transferred to the panchayat s along with funds and functions, such dependence on bureaucracy will continue and will not be in the interest of effective implementation of anti-poverty programmes," the Planning Commission warns. One decade later, the government has renamed the scheme Jawahar Gram Samridhi Yojana to create more wage employment and more village structures. In this new incarnation, jry wage generation was made secondary and creation of infrastructure to create sustained employment was made the priority. Again nothing substantial changes were made to the jry to right its shortcomings. Rather, it strengthened the district bureaucracy's control over the programme. Under the new programme, designed as an integrated rural development programme, villages still don't enjoy absolute autonomy. The district bureaucracy still has control over panchayat s. And the bureaucracy wrested control by bifurcating the money through the eas . Transperancy can be achieved as it is implemented through a community body Community doesn't have any control over this project and transperancy yet to be incorporated into this project. Thrikkakkara in southeast Ernakulam district is like any other panchayat in Kerala witnessing a rapid transition from a village to a town. The panchayat houses the All India Radio broadcast station, the headquarters of the district administration and many commercial institutions. Yet the panchayat also comprises elders who are treasure houses of the fast-disappearing knowledge of natural biodiversity. These are people who can differentiate at least 24 varieties of rice, use more than 50 local plants as herbal medicine and cultivate 12 varieties of banana, seven varieties of tubers or eight varieties of mangoes. Such knowledge and those who hold such knowledge on the natural/cultivated species of plants and animals have now been brought to the public domain not only in the Thrikkakkara panchayat, but also in all the 86 panchayats in Ernakulam district through a massive, collective exercise called the People's Biodiversity Register Programme (PBRP). This is not the first time that the People's Biodiversity Registers (PBRs) is being attempted or its perceived merits and dangers debated in the state. The Kerala Sastra Sahitya Parishad (KSSP) had compiled a PBR of Puthur panchayat in Thrissur district in early 1990s. If these were pioneering efforts guided by a handful of spirited volunteers or activists, the preparation of 86 PBRs in Ernakulam district is the outcome of appropriating the concept of PBR within the decentralised planning process, the People' Plan Campaign, now underway in Kerala. It goes to the credit of the Ernakulam district panchayat and a few social activists including M K Prasad of KSSP that the local body could take up the PBRP, despite the fact that the People's Plan Campaign had not officially recommended any specific programme for district level documentation of biodiversity in the Ninth Plan. The PBRP, launched in 1998, was, instead, supported and funded by the planning department. An elaborate network of working groups was created for the programme in all the three tiers of the panchayati raj structure -- district, block and gram panchayat -- and even further down to all the 885 wards in the district. The groups comprised resource persons from academic circles, elected representatives, students, teachers, social activists and many volunteers. Information was gathered from elders and other knowledgeable persons of each ward through informal interviews as well as group discussions, wherein the local availability or uses of many species were thrown open for debate. "Field studies were conducted subsequently to verify several claims and clarify doubts," explained Krishnaprasad, a botany teacher at the Maharajah's College and the principal investigator of PBRP. "The whole process went on for nearly 18 months, much longer than expected." The secondary data on plant and animal species economically or otherwise valuable to the people collected in the process cover 23 broad heads which include grains, oilseeds, cash crops, tubers, vegetables, pulses, fruits, medicinal plants, domesticated animals, birds, insects and weeds. Each PBR also contains information on traditional occupational groups in the panchayat and on people who are sources of traditional/folk knowledge in general and traditional medicine in particular. The data collected through the exercise point to the richness as well as the threatened nature of biodiversity in the district. For instance, 66 varieties of rice are known to have been cultivated in the district as a until recently, but only a handful of them are currently in use. The Thrikkakkara panchayat , where only six varieties are now in use out of 24 known to panchayat elders, is perhaps an extreme case. Over 170 species of medicinal plants have been listed in the whole district and 50 in Thrikkakkara. Of the latter, 23 plants are already in short supply and another 11 have become extremely rare. "There are several panchayats which do not have a single bull but have a number of elephants," points out Krishnaprasad, hinting at how modern practices have decimated several species and also transformed our understanding of 'value'. Apart from providing a record of local knowledge on plant and animal species, the PBRs could serve "as the preliminary basis for recognition of local knowledge systems and their revitalisation," hopes M K Prasad. "It could also alert conservationists and lead them to action for protection of resources as well as local rights over resources. Whether the PBRs could be used as instruments to protect local biodiversity and knowledge from being privatised and patented by commercial interests is being examined by the Union ministry of environment and forests," he says. Even though it is expected that the preparation of PBRs would lead to local level action plans for conservation of depleting resources, so far there is no sign of this enormous task being taken up by the local self government institutions. After the elaborate exercise in Ernakulam district, the understanding was that each gram panchayat would pass a resolution to the effect that the species listed in the PBR are the assets of the local body and that any commercial use of the information would entail payment of royalties and fees. But this has not happened. The municipalities and the district corporation have not carried out PBRP in their respective areas. The Ernakulam district panchayat itself has not thought of any follow-up action aimed at conservation. Even the state planners have not incorporated the PBR programme in the Fifth Year's Plan. Though the State Biodiversity Committee had written to all the 1,000-odd panchayats in the state offering free training on PBRP, the response so far has been lukewarm, points out Prasad. However, three more districts in the state have planned to carry out a repeat of the Ernakulam exercise in the current year. The Employment Guarantee Scheme ( egs ) of Maharashtra is said to be the only one in the world that guarantees employment on demand. This was for the first time an employment generation programme was conceived to create productive works at the village level. The absence of social institutions at the village level to manage infrastructure like water harvesting structures built under egs now threatens the scheme's effectiveness. "It is now necessary to evaluate the programme," says Ashok Basak, secretary to the state's planning board, which implements the programme. "Whatever the reason, egs , as a development project, appears to have failed to engage the villagers' participation. Now, one may say that the major intention of egs has never been to promote people's participation in rural development," points out Roland Engkvist of the University of Lund in Sweden in his 1995 evaluation report of the scheme. egs was launched to deal with the famine of 1972, as well as to uplift agriculture in the state that had a growth rate of 0.07 per cent in 1960-70. It was given statutory status in 1977 by the state assembly. egs now spends some Rs 500 crore annually, 50 per cent of it collected through six different taxes levied exclusively for the egs , and the rest is contributed by the state government. The government claims that the average daily unemployment rates in rural Maharashtra has declined from 7.20 per cent in 1977-78 to 3.17 per cent in 1987-88. But, the recent spate of malnutrition death of children in the six tribal districts belies this. The admission of the state tribal welfare minister that unemployment and the drought have been responsible for the deaths cast a shadow over the effectiveness of the programme. Sixty per cent of its employment generation is in six rain shadow districts in western part of Maharashtra. Migration continues in these areas due to the wage disparity between egs and the basic minimum wage in the state. " egs continues with the assumption that state's social condition hasn't changed in the last three decades," says Vilasrao Salunke, managing trustee of the Gram Gaurav Pratisthan, Pune. There's been a constant decline in demand for jobs under egs . "The reason is that egs is no more a proposition for survival as sugarcane fields offer more money," says M H Suryanarayana, professor at the Indira Gandhi Institute of Development Research, Mumbai. "Because it did not involve the stakeholder directly in creating wealth, it became a failure," says Mohan Dharia, former deputy chairperson of the Planning Commission. It is alleged that the programme prioritises only roads and buildings rather than productive assets like soil and water conservation structures. In the past 10 years, spending on irrigation and agriculture has decreased by 50 per cent while road construction has recorded a rise of around 40 per cent (see table: Wrong priorities ). "As far as asset creation is concerned it is a successful programme. But going by sustainable asset creation, the programme is a major failure," says Salunke. More than 350,000 different works have been executed since 1973 but government statistics don't have any status report on these. "Over 8,000 tanks have been built but all of them are silted," says Salunke. " egs disbursed money but did not institutionalise the ownership of the communities," says A M Gokhle, additional secretary with Union ministry of environment and forest, who was deeply involved in jry . Bimalendu Saran, district magistrate of Ahmednagar, one of the most drought-prone districts of the state, says a little reorientation in the programme will do magic. Without any institutional setting to monitor the structures created, maintenance totally rests with the district authorities. Also in many cases works remain incomplete due to non-attendance of labour. In Ahmednagar district itself, 209 roads have not been completed, though the work began almost a decade ago. "The pressure of maintaining works is so high that hardly 20 percent of the works can be monitored," admits Saran. During the 1999-2000 drought, Down To Earth ( dte ) reported that five villages in Gujarat and Madhya Pradesh had enough water during the drought because of the water conservation activities they had undertaken. dte revisited these villages, reeling under the second successive drought. Unlike last year, some of these villages are facing water scarcity and people have had to migrate to earn their livelihood. However, judicious water management planning has left these villages in a slightly more comfortable situation than villages where no such work was undertaken -- drinking water is available, although crops have failed due to lack of water. "In a recent survey I found that in the second consecutive year of drought, watershed villages have done more community planning for using the available water than in non-watershed villages," says Kuldeep Sagar of Development Support Centre ( dsc ), an Ahmedabad-based ngo involved in watershed projects. A study by dsc shows that villages with watershed development programmes managed the 2000 drought better than those without such programmes. Anil C Shah, chairperson of dsc , says, "Villages with a few years of soil and moisture conservation activities are way ahead of other villages as far as fodder and drinking water supply is concerned." dsc 's survey shows that to realise higher gains of the potential created requires several measures by way of extension and linkages to resources of knowledge, credit, marketing. This is known as "watershed plus", which may be undertaken either parallel to watershed development or sequenced later. The availability of water in villages with water conservation measures is directly proportional to the number of years put into water conservation and the presence of village level institutions to manage the resources and distribute them equitably. For example, Raj-Samadhiyala village took up water conservation in the late 1970s. The village harvested two crops and some farmers took a third crop as well. In the neighbouring village Kasturbadham, the water table has done down drastically and 60 per cent of its residents have migrated. Gelhar Choti in Jhabua took to water conservation four years ago. It fought the last drought well, but the current drought has shaken the community. The village-level institutions formed to monitor watershed activities have collapsed with migration of residents. Villages all over Gujarat are demanding water tankers from the government. Raj-Samadhiyala, however, has resolved to not accept government water. "Water must come from the people," says Hardevsinh Balwantsinh Jadeja, head of the village council for the past 22 years who scripted the village's transformation. This is probably the only village in the Saurashtra region that has harvested up to three crops, although it rained only 100 mm, against the average of 500 mm. The monsoon crop was 100 per cent and the winter harvest was 50 per cent. About 10 per cent of the residents have gone in for summer crops. The third crop of vegetables has earned some people more than the price of their land as vegetables are very costly. From a village adopted under desert development programme to the present state was a journey that began with the severe drought of 1986, when the village took up watershed development -- 15 years and 45 check dams later, the village is an example of integrated village development. This year as there is no surface water, but 30 of the village's 280 wells have water. The village has a strict water management plan this year to ensure water availability till the monsoon. Strong village institutions have made this possible. Village councils in all Gujarat villages have been suspended in view of the forthcoming elections to the local bodies, leading to chaos in drought relief. A village development committee ( vdc ), formed by the community, manages Raj-Samadhiyala. The committee has 13 members -- each member representing a cluster of 25 families. It monitors the village council. "It is the most powerful body in the village and exists beyond government control," says Jadeja. In the absence of any statutory elected body at the village, the committee has taken over drought management. The vdc had chalked out a plan in 2000 to weather the drought after organising a village assembly. Its decision to not lift water from any surface water reservoir has helped recharge groundwater. Residents can lift water only from their wells. "We had enough water stored beneath the surface. The monsoon showers added to it." This year, the wells that have water cater to all the farmers equitably. "To manage the crisis we have turned our private property into community resource," says Babu Moti, a elderly resident. Cash crops have been partially banned to minimise water use -- the key lies in using the scarce resource judiciously, Jadeja notes. The village can manage the kharif (monsoon) crop even if the monsoon fails again. The village is not sitting idle on its past achievements. Its catchment area is very small: 1.5 sq km. The vdc has procured satellite images of the village's topography. These show underground cracks running 35-50 metres under the surface, formed by earthquakes thousands years ago. The village is excavating these cracks and directing rainwater to them. "It costs less than a check dam but stores thrice as much water," says Jadeja. While digging such a crack, the water table was quite high: 12 metres under the surface. This village in Dahod district of Gujarat is battling third successive year of drought. It rained only 240 mm this year, as against an average of 840 mm. Nine years ago, Mahudi began building a series of small dams on the seasonal river Machhan. Last year, the village reaped a normal harvest. This year, it has taken up drought mitigation measure. In July 2000, it became clear that another drought loomed large. In a village assembly, all water-intensive crops were banned and priority was shifted to ensure drinking water. The lift irrigation cooperative society, which manages the dams on the river, was put in charge of monitoring water use. "Water availability is less than 20 per cent of the normal storage in the village. So, the immediate concern is to save water for drinking and to take up the minimum crops to sustain ourselves," says Hartabhai Devbhai Katara, a resident. Maize was cultivated nevertheless, as it provides fodder for the livestock. The Down To Earth reporter who visited the village in the last week of April 2001 noted that the village has not reported any migration as it took the kharif (monsoon) crop and reaped a partial rabi (winter) crop. 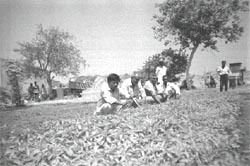 In early summer, after taking stock of the water available and the intensity of drought, the society allowed the cultivation of vegetable. This helped in checking migration. However, 200 of the village's 400 residents work in a relief camp nearby. In 1993, this village in Gujarat's Saurashtra region began recharging its 150-odd wells that had gone dry by directing rainwater into them. Till 1998, they reaped good harvests due to this investment. Then began their tryst with drought. In the past two years, the village managed on the strength of the good harvest of the past. This year is different. The people had a choice: they could either migrate or use the last of their remaining resources. Saudas Senjelia, who mobilised the village to recharging wells, says that the village can't depend on the recharged wells beyond this year. The 2000 monsoon rained 60 per cent below normal. By the end of April 2001, only 10 wells had water. The monsoon crop was harvested in at least 60 percent of the cropped land, irrigated with water from recharged wells. But the winter crop was more limited. Residents say the good harvest was due to the normal monsoons of 1993-98. "During this period, grain stocks in the village went up and average income doubled. The surplus created has helped them sail smoothly through the worst drought," says Shamji Antala of Lok Manch, an ngo credited with recharging of 700,000 wells in Saurashtra. The village suffers from the absence of a community institution to manage its water, particularly when it is facing a crisis. Recharging of wells spread in this village as private efforts of individuals. "It anyway doesn't lead to abuse or misuse of the resources created as farmers have adopted different methods to plan use of available water in their wells," says Antala. For example, all the 10 well owners with water didn't take up the winter crop, opting for fodder crops. Although there is very little water in the village this year, the residents don't beg the government for water tankers -- they pay for their tankers. "This is an indicator of the village's prosperity," says Antala. After taking up measures under the Madhya Pradesh government's Rajiv Gandhi Watershed Development Mission, this village sailed through the 2000 drought. The watershed mission has withdrawn from this village, handing over management to the watershed committee. "Rise in water table after watershed activities was enough for one year. This year, however, we don't have water and fodder after the monsoon failed," says Ditiya Singh, president of the village watershed committee. Six of the eight handpumps that had water last year have completely dried up this year. "It is a mad rush every morning for a bucket of water," says Pan Singh, a resident. The remaining two handpumps yield a little water once every 14 hours. After both the monsoon and the winter crops failed, two-thirds of the village's total population has migrated. Residents feel that the situation would have been better if the government had continued its watershed programme for some more years. "In last three years, the village had noticed an improvement in agriculture after water became available. Besides government jobs kept people in the village during the lean period," says Singh. In October 1999, the state government stopped its watershed activities due to lack of funds. As employment opportunities came down -- that, too, in a drought year -- people started migrating. This led to the collapse of the village-level institutions created under the watershed mission. "The timeframe of four years is very limited as it takes at least two years to mobilise people for the programme. In just two years it is difficult to show results," says R K Gupta, additional chief executive officer of the district council. For a village that tripled its irrigation potential in just three years, two consecutive years of drought have reversed the wheel. "We shouldn't withdraw from villages that have just finished four years under the watershed development programme. But, given the guidelines and the target set up, we have to move out to other places," says Gupta. An analysis of the government's failure at drought relief shows some clear loopholes that are not very difficult to plug for a government that is worried about its political future. The most important thing is to plan decentralised, village-level institutions to both manage drought relief and come up with strategic initiatives to provide security against drought. All government schemes have been plagued by the more-structures-no-institutions approach. Even if water conservation structures like tanks are built -- despite the phenomenal corruption and pig-headedness in the government machinery -- there is no effort to mobilise local preparedness. The Jawahar Rozgar Yojna is perhaps the only government scheme in which money goes directly to the local government bodies. Even this has suffered from the bureaucratic functioning that prevents the much-needed money from reaching the people. The answer to the weakness in jry would be more jry . Only this time, the involvement of the village assembly should be made mandatory. The effort of the bureaucracy-politician combine to weaken and discredit this cheme is understandable, but pathetic and unfortunate. On May 21, Prime Minister Atal Behari Vajpayee talked about the suggestion made by eminent agriculture scientist M S Swaminathan to create grain banks at the village level. This was at a meeting held with all the chief ministers on the World Trade Organisation ( wto ) and agriculture. However, no thought has been put into the details of implementing this. But at the same meeting he talked about his dream project of rural roads. His administration wants to use the surplus grain (worth Rs 50,000 crore) to build more roads. People in villages where roads are being built under drought relief point out that the quality of the roads is kept poor so that drought relief is organised again the next year.